Last week, President Obama’s vestigial campaign sent out an infographic touting his plan to address the fiscal cliff. This plan would end the upper Bush tax cuts and cut spending by more than $3 trillion, including the cuts already signed into law since early 2011, and preserve nondefense public investments in areas like education and infrastructure. There’s an irony in that the cuts already signed into law were never actually supported by the president, who only relented when the House GOP threatened to shut down the government (the spring 2011 appropriations showdown) and collapse the economy (the summer 2011 debt ceiling showdown). He was right then, because these cuts—particularly the half that come out of the domestic discretionary budget—are horrible policy. Domestic (non-security) discretionary spending is the portion of the overall budget that not only delivers the primary source of investment in our nation’s future, but also provides vital services to people in need, protects Americans from corporate abuses and environmental degradation, and keeps the government itself operating. (The nondefense budget includes all of non-security plus homeland security, veterans affairs, nuclear weapon security, and foreign affairs.) Bottom line, it’s important stuff. And yet over the last year, the president has begun touting the fact that his budget brings the non-security portion of the budget down to record low levels—“the lowest level since President Eisenhower,” as the president is fond of saying—as if this is somehow a good thing. More frustrating, however, is his claim that he can cut domestic spending down to these levels while protecting public investments. In 2011 I analyzed data from the Office of Management and Budget (OMB) and found that roughly half of non-security discretionary spending is classified as public investment by OMB. The table below updates the original analysis for the president’s most recent budget, and also presents shares with the Highway Trust Fund (HTF) in either the discretionary or mandatory budget. This is necessary because on the one hand, HTF spending is technically discretionary and must be appropriated each year, yet it has mandatory budget authority and does not fall under most spending discretionary caps; its levels are instead restricted by the authorizing legislation. But no matter how you slice it, public investments are a large share of the domestic (NSD or NDD) budget. And that’s why as a practical matter it’s impossible to cut the domestic budget down to historic lows and not cut public investments, let alone maintain them as a share of the economy (which necessitates increasing them in nominal terms). Even President Obama, who I’m sure doesn’t want to cut these investments, proposes budgets that do just that. The data show that if surface transportation is classified as discretionary, public investment averages about 55 percent of the non-security discretionary budget and 45 percent of the nondefense discretionary budget, which unlike NSD includes security items (homeland security, foreign relations, veterans affairs, and nuclear weapons). This share falls by a few percentage points if surface transportation is classified as mandatory. 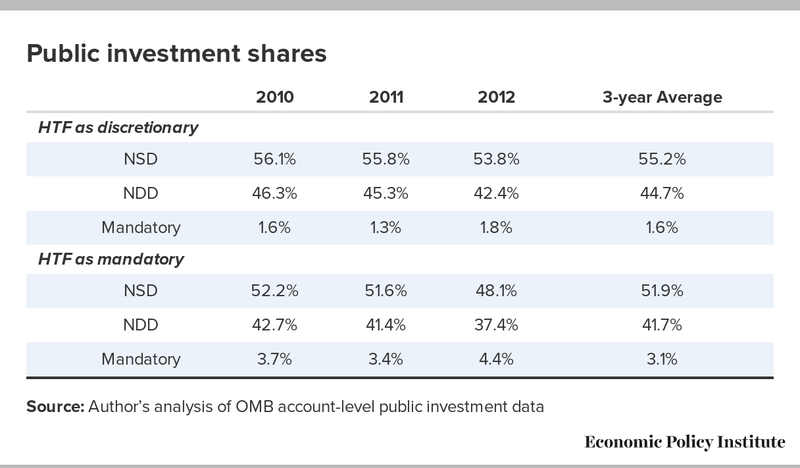 It’s hard to tell, of course, because the public investment data posted by OMB only goes through 2013, but by merging the account-level public investment OMB data with its Public Budget Database we can recreate the public investment path through 2017. And sure enough, President Obama’s budget shows reductions in public investment as a share of the economy. This is not to criticize the president specifically, but rather to note that everyone seems to be underestimating how hard it will be just to maintain public investments, let alone restore them to the levels we had during the 1950s and ’60s when we last had a sustained period of rapid and broad-based economic growth. Note: In making this calculation, I applied each account’s public investment share to the Public Budget Database outlay projection, which is available through 2017. Since some accounts in the FY13 budget were new, I lacked public investment share data on them, making the projected levels too low. To compensate, I re-based the five-year projection so that the 2012 projection data matched the 2012 historical data.